Earlier this week, the final turboprop operating on behalf of American Airlines landed in Maryland. It marked the final propeller-powered flight for a “big three” legacy carrier in the USA. The de Havilland Canada Dash 8-300 flew from Charlotte (CLT) to Salisbury, Maryland (SBY) on July 4th. Operated by Piedmont Airlines for American Eagle (AA’s regional airlines), the flight arrived at 8:35 p.m. to a number of waiting av-geeks. Think about the historical moment this actually is. American (1938), Delta (1928), and United (1928) all used propeller planes to operate their first flights and have used propellers, to some degree, ever since. United ended its prop service in late May from its Guam hub. It had already eliminated prop service in the Continental USA earlier this year. Delta ended prop service in 2013. This moment marks the end of a glorious era in aviation. The final AA turboprop was under the command of Captain Malcom Ferrand, a third-generation pilot. His grandfather was a World War I pilot while his father flew for United. 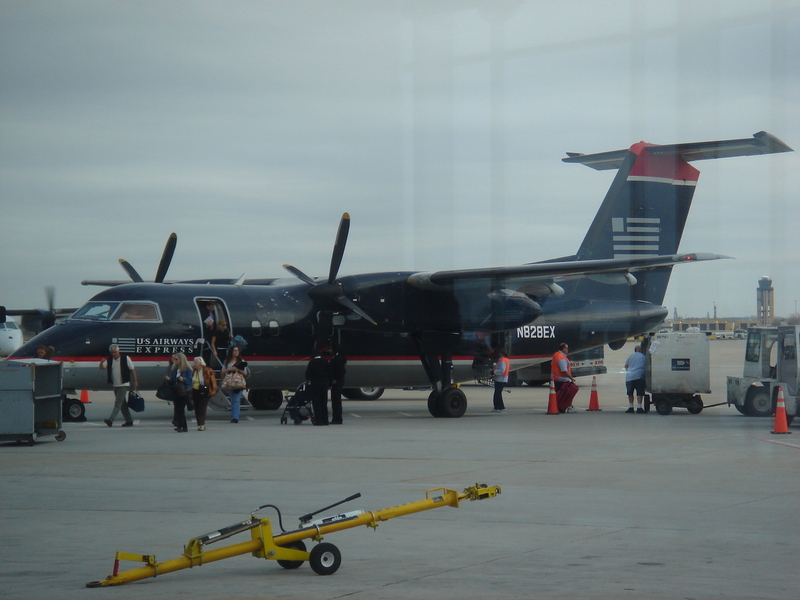 The choice to end Dash-8 services in Salisbury, Maryland is an interesting one to me…I used to fly into that airport during my Air Force flight training in 2005…on a turboprop. The turboprop era in the USA is not over yet. It may never be. Alaska Airlines’ Horizon Air subsidiary still flies the Bombardier Q-400. Porter Airlines still exclusively uses propeller-powered aircraft. Yet with the final prop flight in AA livery, an era now comes to an end. With the expansion of our runway, Hilton Head, SC , HHH, also entered the Jet Age this week. There are many Q400’s and atr’s Still out there. We have a long way to go before the last one flys. The old Piedmont (Henson) and Allegheny Dash 8’s lasted close to 30 years. I like turboprops. I take a PC-12 for most flights flights shorter than 2 hours. It’s the turbine suburban. I work in the aviation maintenance industry. We’ve been a little surprised with how long the DHC-8s have hung around, especially the older Q100, Q200 and Q300 series. I suspect the newer Q400 version will likely be flying for awhile. I believe Horizon Air is the largest domestic operator. Turboprops (especially the DHC-8) are economical and versatile. The short take and landing (STAL) capability make them ideal for smaller airports; and their fuel burn is quite good when compared to regional jets. They’re also fairly inexpensive to maintain. I equate them to having a 2010 Honda Civic in the garage. Sure there’s better options available for transportation, but that Civic is reliable, will get you where you’re going and won’t burn a ton of fuel doing it. It’s also small, easy to park and maintaining it is generally pretty cheap. However, not too many folks are going to be excited to ride in the Civic. I’m sure time will eventually expire on these old birds, but I suspect it’ll take at least 10 more years before the majority of commercial turboprops are completely obsolete in the US. In hard to reach airports or airports with harsh conditions like Northern Canada and Alaska, these birds will likely be useful for decades to come. For me personally, I usually enjoy flying turboprops if for nothing more than a different experience once in a while. I mostly fly Delta out of ATL and there’s not many (if any?) turboprops running routes out of ATL for Delta these days. It is an interesting choice, but considering the HQ of Piedmont is in Salisbury, MD..it makes perfect sense. Very touching documentary by Piedmont as well. I remember when I lived in Charlotte and used to have to fly out of there for work the love that everyone in that area still had for Piedmont many many years after it was absorbed into USAir and then American. Every time I fly a turbo prop, I imagine I’m piloting a de Havilland mosquito. I come from the pre-jet era, so have a fondness for props. Some of my strongest childhood memories are of Stratocruisers, Constellations, Viscounts and Vanguards. Looking at them in museums these days,, they look very antique , but we thought they were super modern at the time, in the ’50s. But in a flash they were gone as the 707, DC8 and Caravelle came into service. I still enjoy the turboprops when they appear ( LCY still has a few services ). Used to love flying those little birds from LAX to SBA in the early 2000s to visit my girlfriend. Hawaiian Airlines’ subsidiary ‘Ohana flies ATR-42s from Honolulu to Lanai, Molokai, and West Maui. Silver Airways flies turboprops in Florida and the Caribbean: currently SAAB 340s but soon ATRs. Various Alaskan carriers (Pen Air, Ravn Alaska) operate props intrastate. It’s not quite over yet. Had the privilege back in the late 1960s to fly in an East African Airways DC-3 out of Arusha…the jet age is a lot more comforable, but flying in that old bird was a treat for sure.